There are Cargo (C) Version and Tanker (Fire Protected - T) Version. Capacity from 20 to 150 persons. The Tanker version has a sprinkler system and a specialized air supply system, as per SOLAS regulations. 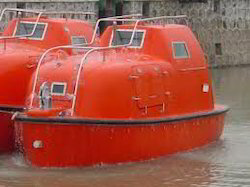 Several Options Type of Davits are available for these Totally Enclosed Lifeboats. A S Moloobhoy Pvt. Ltd.
A Lifeboat (life raft) is a small, rigid or inflatable watercraft carried for emergency evacuation in the event of a disaster aboard ship. In the military, a lifeboat may be referred to as a whaleboat, dinghy, or gig. The ship's tenders of cruise ships often double as lifeboats. Lifeboat drills are required by law on larger commercial ships. SOLAS approved pilot and accommodation ladders. Safety equipment, lifeboat and life raft supplies. We are a key player in manufacturing and supplying premium quality Life Boats in Mumbai, Maharashtra, India. Our provided range is made by our skilled personnel in strict adherence with set industry standards. The offered Life Boats are made accessible in different sizes, shapes and other specifications, as per emerging demands of our customers. Riding on vast volumes of expertise in this arena, we are occupied in offering Open Life Boat. we can used in water resort, rafting, adventure park, lack and river.